There are still some small businesses and government agencies which may not accept documents over email and they strictly instruct you to fax all the documents. If you want to send a fax you need a fax machine. If you are not having a fax machine, you have to take the document with you and search a document center so that you can fax it. Doesn’t it feel like a very long process and time taking task? But you will be surprised to know that instead of doing this, there is an easy way to send and receive faxes online without a fax machine or phone line. Yes, you heard it right! You can easily receive and send faxes without using a fax machine with the help of internet. There are plenty of best free online fax services which you can use in order to send free fax online. If you don’t want to waste your time in searching out which online fax service is the best for online faxing and want to try a multifunctional online fax service to send free fax online in one click then “HelloFax” is one of the most appropriate option for you. HelloFax is one such easy and reliable‎ service which can be used to send free fax online. HelloFax is a Google Docs add-on which will help you in online faxing. You can easily send and receive faxes online using HelloFax or it can be said: you can send a fax without a fax machine with the help of HelloFax service. HelloFax allows you to send 5 pages free in a month after which you have to pay a monthly subscription fee to access the service. If you want to use HelloFax for receiving faxes, you can set up an account and get your own personalized fax number. The online faxing process with HelloFax is very easy to use and it doesn’t require any complex settings. In simple words, HelloFax is a top-rated online fax service which offers multiple options to send & receive faxes from anywhere. 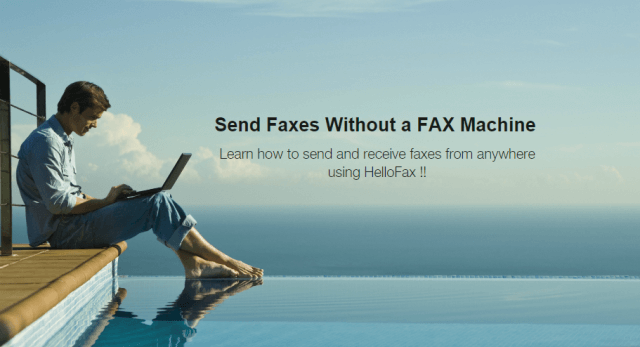 What are the Benefits of using HelloFax? You can Fax to multiple recipients at one using this online faxing service. The faxes which you will send using HelloFax are in PDF format. This makes it easy for one to read the faxes, share them and downloading them. HelloFax comes with unlimited storage. This allows you to store as many as faxes you want to store on your account. You can access your faxes from anywhere using any device. You can sync your HelloFax account with cloud services like DropBox, Google Drive, OneDrive and Box. If you were already using a number for faxing documents, you can port that number with your new HelloFax account. If you are using Google apps, you can integrate your HelloBox account with it. These are some of the benefits of Hello fax. Now that we know the advantages of Hello Fax, let us find out how to send a fax without a Fax machine via HelloFax. Step (1): First of all, open Google Docs on your web browser. Now you have to open the document which you wish to send. Step (2): Now click on the Add-ons button present on the top. From the drop down menu, select Get add-ons. Step (3): You will see a search bar. Here you have to search for HelloFax. Once you see HelloFax in the search results, click on the +Free button (in blue). Just after the click, the add-on will be saved on your Google Drive account. You have to give permissions so that add-on can run and you can send the fax. Click on the Allow button. 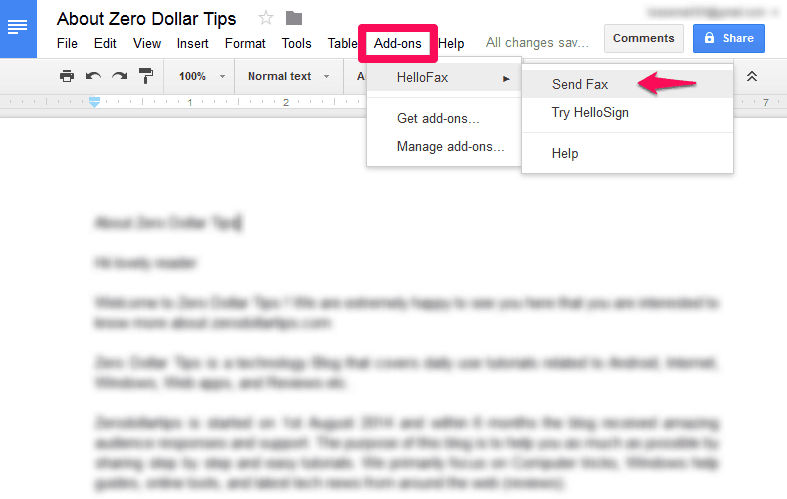 Step (4): Once HelloFax add-on is installed in your Google Drive account, click again on the Add-ons button located at the top. This time, you will see HelloFax in the drop down menu as it is installed. Click on Send Fax button. Step (5): You will see a new panel on the right side. You will be asked to Enter fax number. Enter the number and make sure that it is correct. Step (6): If you want to add a cover page, you can click on cover page button. Here you can mention details like To, From along with a short message if you want to add. 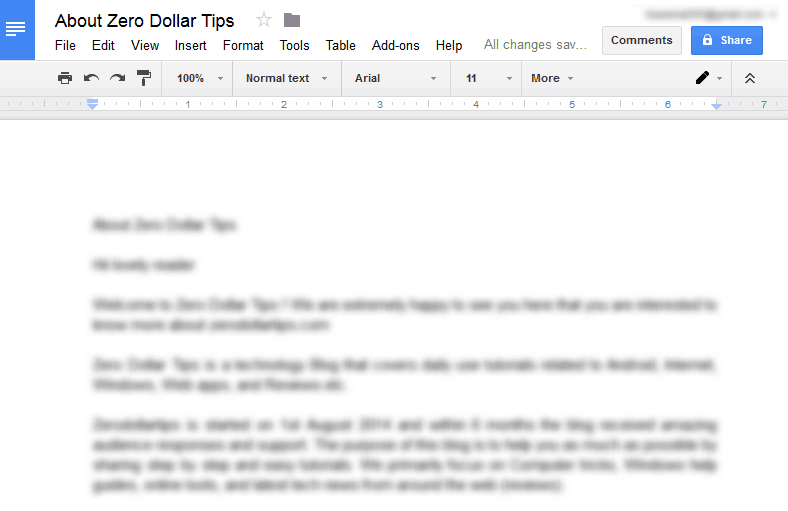 Step (7): Once you have entered all the details, you can click on the Send button. That’s it! This is how to send fax from computer without fax machine. This is the easiest method if you are wondering how to send and receive fax online without a fax machine. So, now send free fax online and enjoy!! You can only send 5 free faxes in a month using HelloFax online faxing service. If you want to send more faxes in a month, you can subscribe for the premium service which allows you to receive faxes also. If you are using any other interesting free online faxing services to send and receive faxes online, feel free to share it with us using the comments section below. We hope, now you learned how to send a fax online for free or how to send a fax without a fax machine using one of the best free online fax services like HelloFax service.